A wide range of Smart Devices from TPI. Use with TPI Smart Phone Apps to measure, display, record and email readings: Flue Gas Analyzer, Single and Dual Input Manometers, Thermocouple Thermometer, and Indoor Air Quality. The 608BT Digital Manometer with Bluetooth®Communication measures pressure or vacuum in four units of measure. Single input manometer with +/-150mBar range. Four units of measure: inH2O, mbar, KPa, PSI and mmH20. Backlight display. Dual input differential manometer with +/- 60 inH2O input range. Use with TPI Smart Probe App to display pressure. Available Spring 2018! 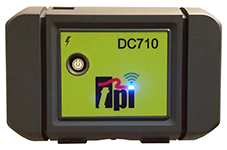 No need for long probe hoses: be at the control center with your smartphone while the DC710 does the work at the stack! Operate remotely via Bluetooth using your Smartphone or tablet and the free TPI app.